These adorable layette gown patterns are a great way to save money on newborn clothes (or make a personalized baby shower gift). When it comes to bringing home baby, one of the most fun parts is doing the preparation. For many new moms, this means picking out all the cute clothes and nursery decor, but also the layette. These gowns are pretty much a staple in any baby's wardrobe for the first couple of months because it makes it easy for mom or dad to get to the new umbilical area and a diaper for quick night changes during those long, sleepless nights. Depending on where you live and what time of year you are due, you may want some short sleeve ones or even some sleep sacks with the bottom closed to keep baby snuggly and warm. 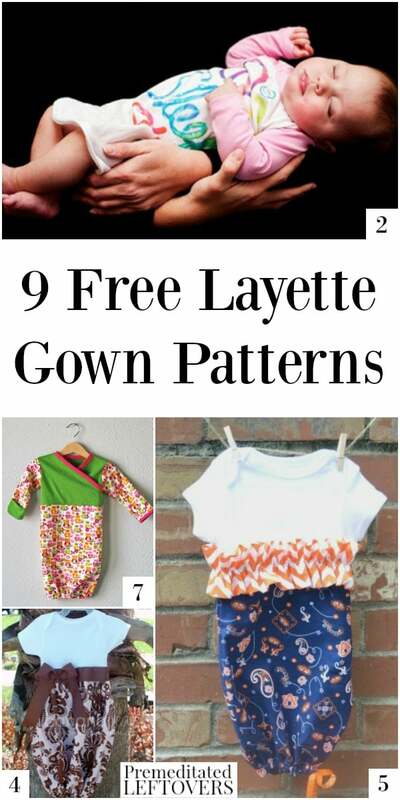 I included all kinds in this list of 9 free layette gown patterns. Some of these are very similar with only a few minor changes, but the changes were enough that I thought they all needed to be included. Enjoy! Handmade Frenzy has this adorable Sweet Baby Sleep Gown and it features handmade fabric letters sewn onto it for a little personalized flair. Too cute! This would make an awesome gift for a baby shower, too! If you are looking for something that is perfect for summer and can be made in all kinds of sizes, make sure you check out Everything Your Mama Made and More's “Riley's Nightgown and Sleep Shirt” pattern. It can be made for newborns all the way up to tweens! For cooler environments or if you baby is due this winter, a Sleep Sack from Small Dreamfactory might be in order. It is a little different from the traditional layette, but it looks like you baby would be all sorts of snuggly in it and it is still easy to remove for nighttime diaper changes. Similar to Handmade Frenzy's pattern, these Layette Gowns from Banana Bear Blog feature the use of a Onesie, but with a large bow and some embroidery work. If you have a sewing machine that allows for it, these would also make great outfits for your newborn. For a little fancier spin on the Onesie pattern, try adding some ruffles and a little ribbon at the bottom like A Step in the Journey did in their How to Sew a Sleep Sack Tutorial. For a very basic and delicate pattern, check out Gingercake's Newborn Baby Gowns Sewing Tutorial. These would be good to make for practical every day use and they look like they wouldn't take long to make, either. This Baby Sleep Sack pattern from Running with Scissors is more like a regular layette gown mixed with a kimono style one. I think it is one of my favorites on the whole list. Speaking of kimono style, here is an adorable Baby Kimono Wrap Tutorial from Sew Mama Sew that is sure to be one of your favorites to make and dress the baby in! Don't think I forgot about the boys! This amazing Rockin' Baby Gown Tutorial from This Mama Makes Stuff not only features awesome patterns but making use of your old band tees and vintage tees to upcycle them into something your newest family member can wear! 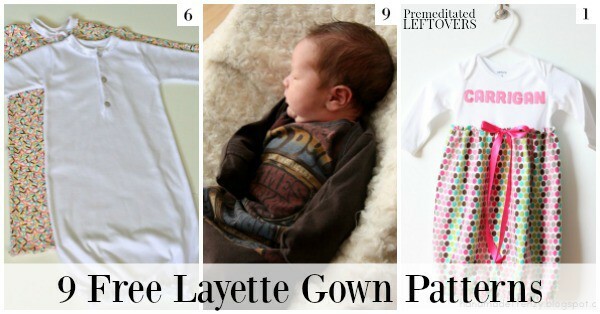 Out of all of these layette gown patterns, which is your favorite? I sure have a hard time picking! I would love to hear how you get ready for baby with you sewing projects in the comments! Thank you so much for posting these; I’ve been looking for some patterns exactly like these – what a wonderful selection you found! New to your blog, thank you! Do you have any easy to sew swadde/smuggler patterns?